Waking Up White is the book I wish someone had handed me decades ago. By sharing my sometimes cringe-worthy struggle to understand racism and racial tensions, I offer a fresh perspective on bias, stereotypes, manners, and tolerance. As I unpack my own long-held beliefs about colorblindness, being a good person, and wanting to help people of color, I reveal how each of these well-intentioned mindsets actually perpetuated my ill-conceived ideas about race. I also explain why and how I’ve changed the way I talk about racism, work in racially mixed groups, and understand the racial justice movement as a whole. Exercises at the end of each chapter prompt readers to explore their own racialized ideas. 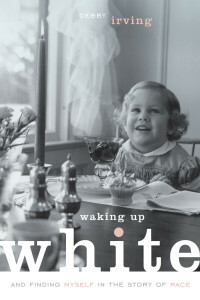 Waking Up White's personal narrative is designed to work well as a rapid read, a book group book, or support reading for courses exploring racial and cultural issues. Available at Your Local Bookstore, Amazon.com, BarnesandNoble.com, and libraries. 50% of profits will go to charities addressing issues of racial inequity. "The first thing Debby Irving got right in her quest to 'wake up' was to understand that until she deeply understood racism as a system and herself as a racialized participant in it, she couldn't do much to be a change agent. Her ability to unravel the way oppression and privilege operated in her own life kept me turning the pages, wowed by her willingness to share her deepest revelations. The insights this book delivers make it a valuable resource for anyone interested in looking at the dynamics of racism and privilege. Even as an antiracism educator and activist for decades, I found myself understanding old issues in a new light. It's an outstanding piece of work about whiteness and internalized privilege." – Paul Marcus, Executive Director, Community Change, Inc.